There is nothing unlimited in this world and it applies to Web hosting also. You have seen that many webhosting companies offering shared hosting account with unlimited disk space, unlimited bandwidth, unlimited resources and blah blah blah. The word Unlimited is just a marketing gimmick and is used by the Webhosting companies to trick and fool the people so that they buy their hosting. 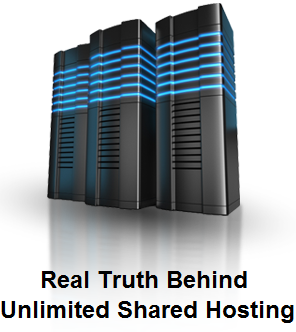 But here I want to unveil the truth about unlimited features of shared hosting for you. Shared hosting is a type of web hosting where a single server is shared among number of websites. The number can vary from company to company but the main thing is that all server resources like CPU, Memory, Disk space etc. are shared among various websites. That is why it is called shared hosting. As the resources are shared, so there are various number of limitations imposed on shared hosting account customers that are explained below. Shared hosting is generally for those people who are new to the blogging world or those who have a small website for business any other purpose with not much traffic. Here are some of the limitations that you will find in every shared web hosting. Here you will find that unlimited in real is very limited and there are various restrictions imposed on website that are on shared hosting server. Web Hosting companies are very strict about their shared hosting account users cpu usage. If your website is consuming lot a cpu then your account will be terminated by the hosting company. Most of the hosting companies fix the top level limit the of cpu usage to 20% or may lesser for a fixed amount of time e.g. 30 seconds or lesser. So if you are on shared hosting then make sure that your site doesn’t consume much cpu to be on the safer side. You can analyze and optimize your website to reduce your cpu load on the shared server or you can shift to the VPS (Virtual Private Server) hosting that will allow you to have your own set of resources. There is nothing like unlimited disk space, the company might say this but in reality it is lie. If you upload more files to the server disk or on database then you will lead your shared hosting account into trouble. If your website disk space or database consumes size in gigabytes then the hosting company will be forced to terminate your account. Also some hosting companies also limit the number of files that you put in one directory on your server disk. Like unlimited disk space, unlimited bandwidth is also a lie said by the web hosting companies to their customers. If your website traffic becomes huge then you will be asked by the hosting company to shift to a better server like vps or a dedicated server. In shared hosting your memory limit is also capped to some point e.g. 512 MB or 1 GB. If your website needs more memory then you will have to contact the hosing provider or move to a better server or plan. You can only send limited number of emails per hour through the hosting SMTP server. This is also throttled by the hosting companies. For sending more emails you will have to shift to a vps ordedicated server. Besides all these limitations the only advantage that I can think about shared hosting is that it very cheap as compared to VPS (Virtual Private Server) or a Dedicated Server.